Blog list | Page 2 of 26 | It`s full of stars! The example used in this blog is a CIFS share from a Samba server running on a Raspberry Pi mounted on demand by a client running Debian. The goal is to have a share on a client that is dynamically mounted. The share should only be mounted when an app needs to access. In my case I do have a server with a data storage share connected. The storage is made available to clients in the network. To not have the share being mounted by the clients all the time, the share should be mounted only when real demand exists. For instance, an app needs to read data from the share. If the share is not needed by the client, it should not be mounted. To understand the scenario better, take a look at the picture below. The process can be separated into 4 steps. Step 1: the client is configured, but the share is inactive. 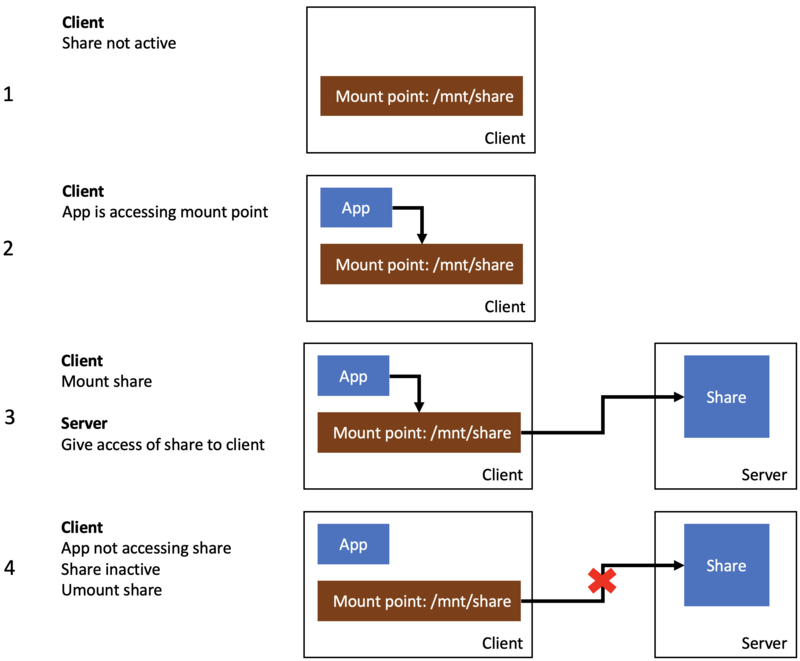 Step 3: The client is connecting to the server and mounting the share to the local mount point /mnt/share. The data is now available to the app. Step 4: The app is not using the data from the share any longer. After a timeout, the client disconnects the share. The example is using for the server a Raspberry Pi with Raspbian and for the client a Debian based system (Proxmox). As share type, CIFS is used. On the client, Samba is running and configured to give access to a named user to the data storage. Install Samba and configure access for a named user. This is not part of this blog. Autofs is the package and tool taking of mounting shares automatically. Install it using apt-get. Autofs needs to be configured. To make it easier, the packages comes with templates. 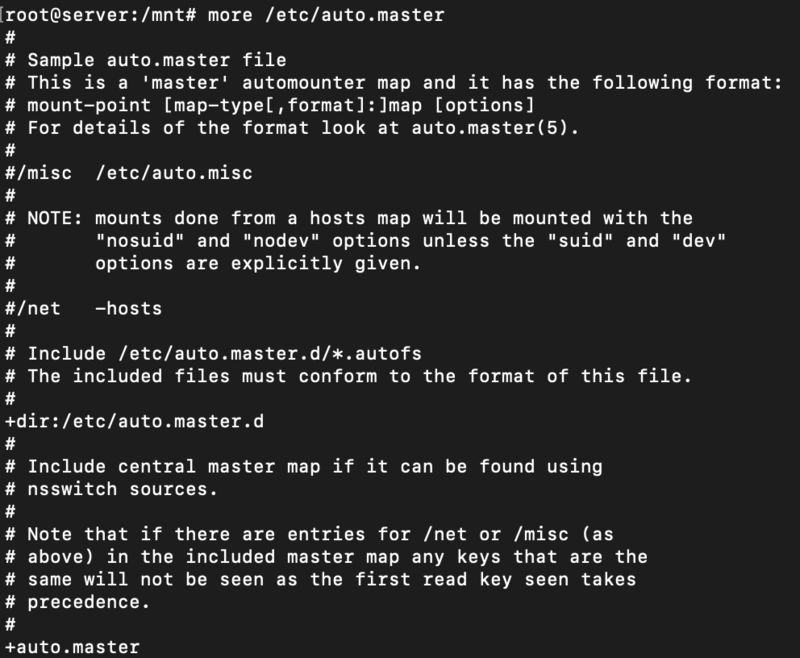 I am going to use the autofs master template as my starting point. Take a look at the master template as it contains an explanation of what is needed. To add an auto mount share a new line must be added to the file. The format is: mount-point file options. Before adding the line, you first must understand how the template and autofs works and what you want to achieve. First parameter is for the local mount point. The directory informed here is the parent. The actual shares mounted are created as sub-folders in that directory. For instance, if you choose /mnt/server and the remote share is data, the final mount point will be /mnt/server/data. I am going to mount the remote share to /mnt/server. The seconds parameter is for the configuration file for that mount point. The third parameter specifies how autofs is treating the mount point. To unmount the share after 1 minute of inactivity, use option –timeout=60. The ghost option will create the subfolder even in case the server is not reachable. 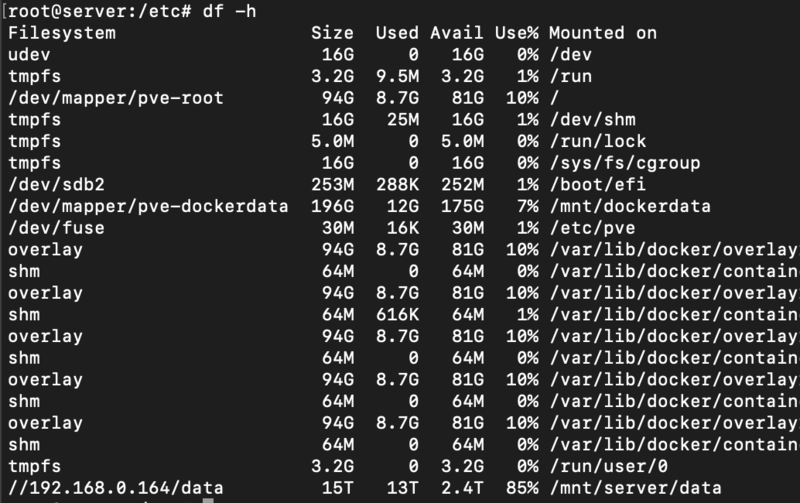 The actual mount configuration for the share is specified in the file /etc/auto.server. Create file /etc/auto.server and edit it. /data – name of the share configured at Samba. In case you have a share configured named Music, or Fotos, or Work, substitute data with the correct share name. Stop autofs and start it in debug mode to see if the configuration works. If it worked, exit and start the service. To test, go through the 4 steps described in the picture at the top of this blog. Client is ready. Check the mounted volumes. You will see that no CIFS volume is available. Using mount, you can see that the mount point is available. In the parent mount point for the CIFS share, autofs created the folder data. Accessing now the content of /mnt/server/data will automatically mount the CIFS share. Assure that no app is using the share and wait until the specified timeout occurs. Check with mount and df to see that the share is umounted. SAP NetWeaver comes with its own solution to prevent clickjacking for its most relevant UI frameworks. For more information about this protection, see the corresponding SAP Notes. Clickjacking protection framework, see Note 2319727. By default, clickjacking protection is disabled. 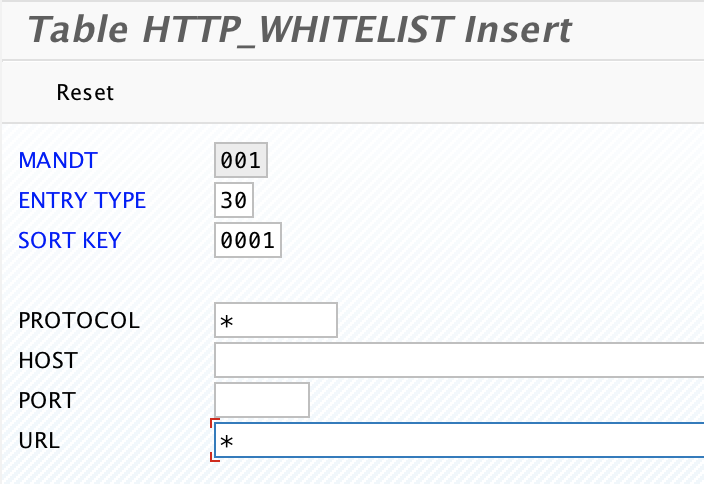 To activate it, you need to insert a value into table HTTP_WHITELIST. Check if clickjacking protection service is enabled or disabled. It is disabled, if no record with ENTRY_TYPE=30 is in the table, or if the table is empty. By default, no values are in the table and the service is not enabled. For data that needs to be inserted into table HTTP_WHITELIST, see SAP Note 2142551. Creating an entry type with vale 30 activates the whitelist. Select F5 or click on the new entry icon. Insert data. See links below for additional information on possible values. Click save to persist the entry in the table. Afterwards, the table will contain one record. As the record has value 30 for column ENTRY_TYPE, the clickjacking protection service is enabled. Adding a record activates the service, but to make apps working, additional configuration steps must be taken. For instance, accessing now a WDA app (e.g. SAML2) will resolve in a HTTP 500 internal server error. This is caused by having the clickjacking protection activated, but not the whitelist service. To solve the HTTP 500 error, you need to activate the ICF whitelist service. After enabling the service and the ICF node, the above WDA app will open in the browser. Additional information on setting whitelist entries. After configuring the overall OpenVPN client and server infrastructure, my clients can connect to a VPN. The client can access server resources and vice versa. While the server gets normally always the same IP assigned, the client IP address is assigned dynamically from a pool of IP addresses. Meaning: there is no guarantee that the client always gets the same IP address. Normally, this is not a problem, as the client connects to consume server resources. Such like a web site, or git repository. In my case, the architecture is that the OpenVPN server acts as a proxy to internal services. The web site, git repository, etc are running on the client. Therefore, the server must be able to connect to the client using a fix address. To make this work, each time a client connects, the same IP must be assigned to. OpenVPN allows to assign a static IP to a client. In /etc/openvpn create folder ccd. Ccd stands for client config directory, meaning: it contains the configuration for a client. 3. Create a configuration file for each client and put into directory ccd. As file name, use the same name for the client as used in the CN field of the client certificate. Additional information can be found in OpenVPN documentation. Error ERR_CONTENT_DECODING_FAILED may show up in your browser when a resource is configured on your reverse proxy, and the backend communication is working. That is: the backend is returning data, but not in a form the browser expects. Example: browser expects a GZIP response, but receives plain text. Therefore the hint from your browser about content decoding failed. The content is received, but the browser is not able to decode / understand the data. If a plain text response is expected, but the received response from the backend is zipped, the browser cannot read the content. Old habits are not easily dying and replaced by best practices and general recommendations. In the early days, when UI5 started to gain traction, people discovered it, tried it out, wrote apps, made them somehow work. Everybody was learning, and things we can do today were not possible or known then. Changes to the documentation, API and recommendations are simply the result of lessons learned. As UI5 apps are based around a model, its data, representation and manipulation, a lot of questions around UI5 development are about the model: how to access data, change, update or delete it. A good thing of UI5 is that it is following semantic versioning, and code written for UI5 1.1x or 1.2x will still work with latest versions like 1.5x. It doesn’t mean that you, as a developer, should simply copy & paste example code found somewhere. First line will give you the model data object, 2nd and 3rd line the property osname of the model. The 3rd line is partly correct, as the access to the data is done through a method, but access to property name is done directly. You can work with the data object now directly, but you shouldn’t. What you want is not to work with the raw data that defines your model, but with properties. This is now only using the methods to access data. To alter the property, use the setProperty method. The above examples may not be perfect. 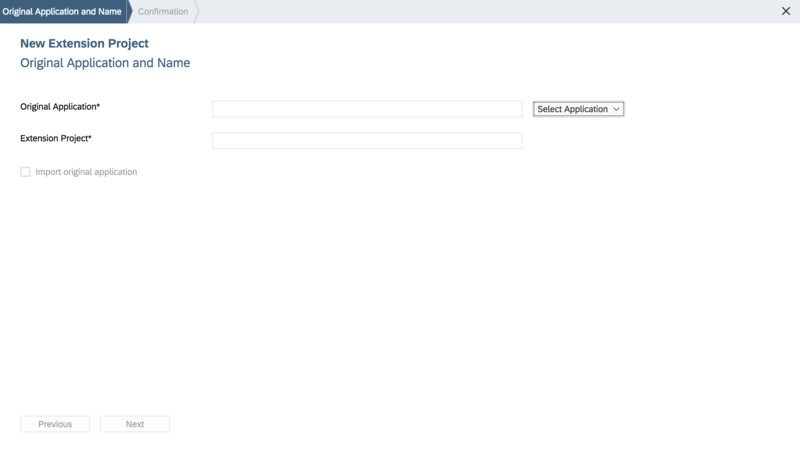 They show that UI5 offers methods to access model data. Using these methods your code will continue to work in the future and is guaranteed to work in future releases of UI5. Direct access to the model data is done at your own risk. In case you work on a UI5 app, use the access methods. If you work on an older app that uses direct access to the model, try to refactor the app. The change from oModel.oData to oModel.getData() is as simple as executing a find and replace. For the below commands to work, you’ll need to use GNU find. If you are using a Mac, you’ll need to install the GNU version of find and mv via homebrew. Create a test folder structure. There will be 3 folders and several files in them. 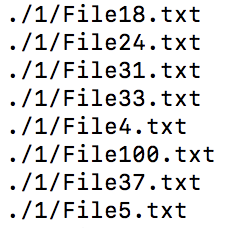 Create 100 files with name TestNN.txt with sample content and place them in one of the three directories randomly. After the initial setup is done, we have several files in 3 directories. If you use find to get a list of all files, you’ll see that the output is not sorted. 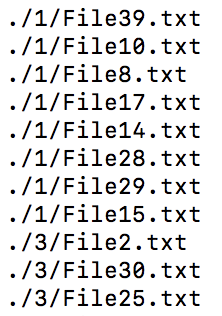 The output is now sorted by folder name and then by file name, but not only by file name. 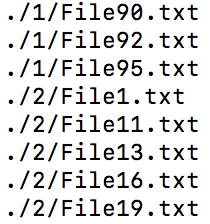 Copying the first 50 elements won’t result in the File1 – File 50. The files are not distributed across the directories as needed. It is possible to see a solution to the problem: sort only on the filename, while still having the complete path in the output for piping the parth to the copy command. Find includes exactly this possibility: print a specific field. To control the output, parameter -printf is available, and %f prints the filename, while %p includes the folder. 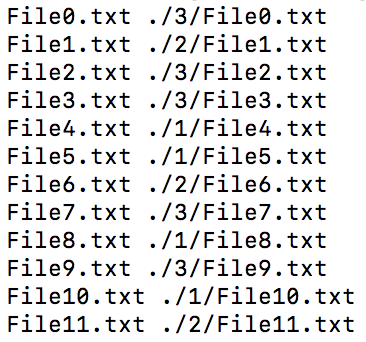 gfind -type f -printf "%f\n"
The output of the command only prints the filename. To output the file with path, use %p. In both cases \n is used to have each file in a new line. gfind -type f -printf "%p\n"
Both output parameters can be combined. %f %p\n will first print the filename, then space, then the path. gfind -type f -printf "%f %p\n"
Applying sort on this output will sort on the file name only. Close, but not exactly how it should be. In case your filename consists only of numbers, this will already work. In the example however, the filename contains characters. Therefore, sorting is not working correctly. 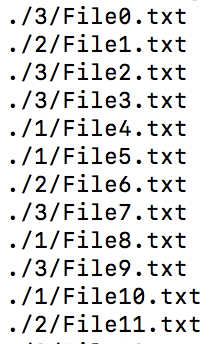 It starts with File0.txt, then File1.txt, but then comes File10.txt and not File2.txt. To sort by the number, add to sort an additional parameter: -k 1.5. As the filename contains a fixed value (File), the parameter will instruct sort to ignore this part when sorting and focus only on the number. Note: you may apply the same sort parameter without using find, just ls. As long as your path has the same size, it will work. For folders named 1..9 it’s ok, but when your folder has two or more chars (like 10, or 213, or test), the parameter needs to be adjusted. 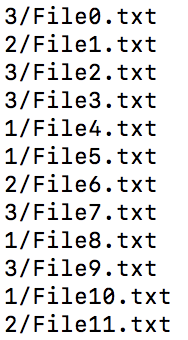 With the last command, the output is correctly sorted based on the filename. 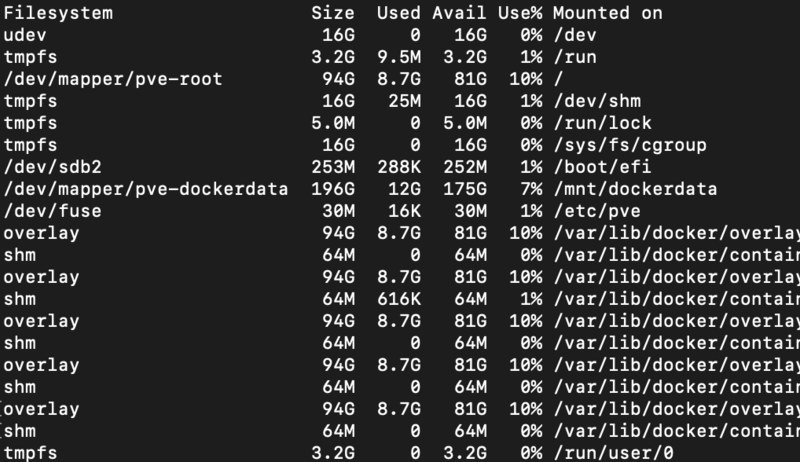 Now, how to use this output to move the files to the target directory? Just piping the output to mv won’t work. The first part with the filename is not needed, only the second part. Both parts are separated by blank, and using sed, it’s possible to eliminate the part before the blank from the output. The last step is now to use mv to move the files to the target directory. To not have to move all files, let’s take only the first 30 files. Gnu mv is needed to move the files, as the default MacOS BSD mv does not include the -t parameter. To pass the files line by line, xargs is used together with gmv. Now there are the first 30 files in folder A.
Connectivity between SAP Cloud Platform and an on premise SAP NetWeaver system is normally achieved via SAP Cloud Connector. 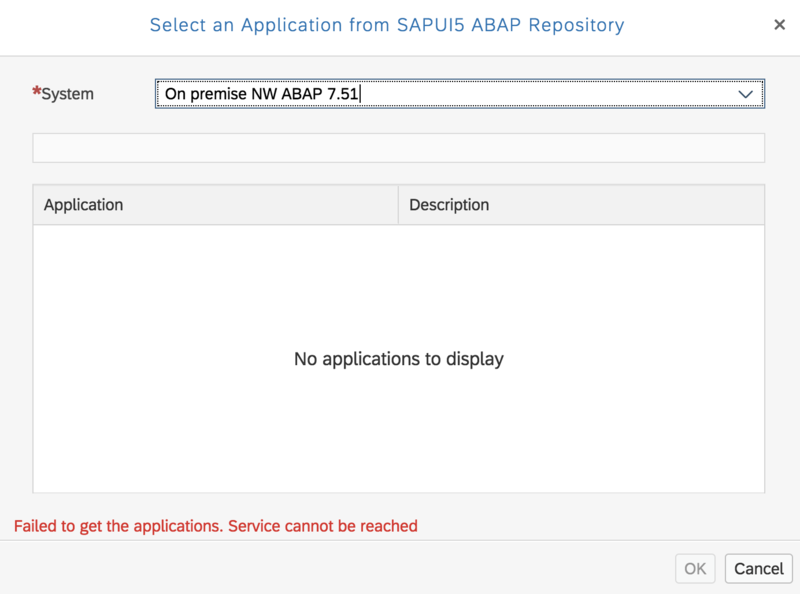 A nice feature depending on this is the remote connection of SAP Web IDE to an on premise ABAP system. 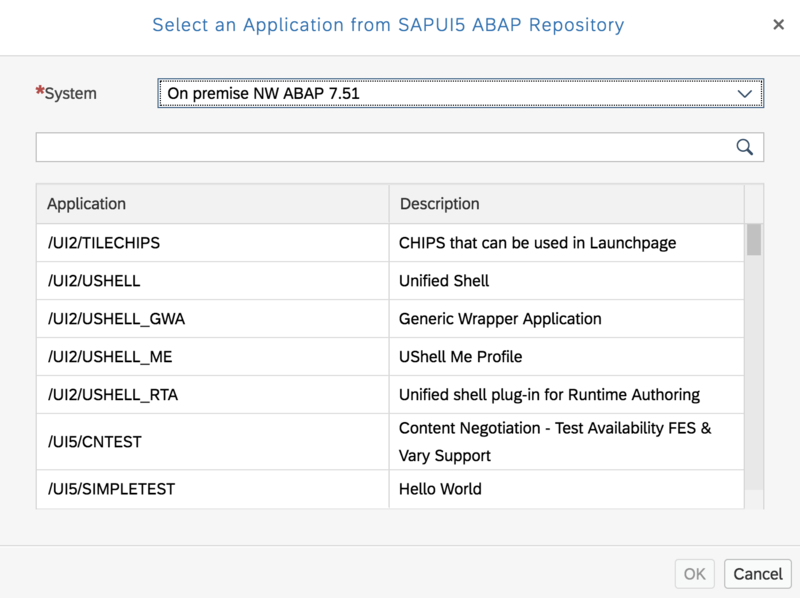 The feature allows to easily load apps from the ABAP system and change or extend them from everywhere. 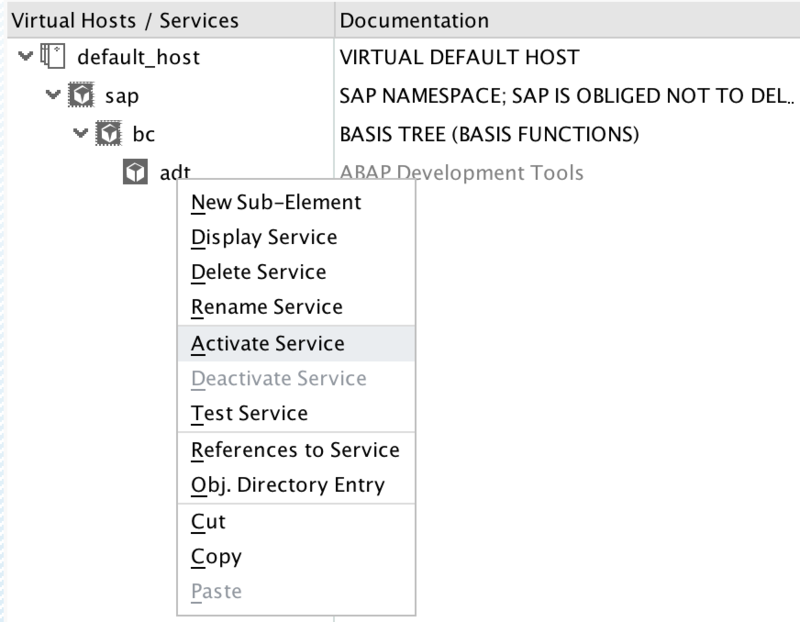 For this feature to work, some ICF services must be active on the ABAP system and remote access enabled on SCC. 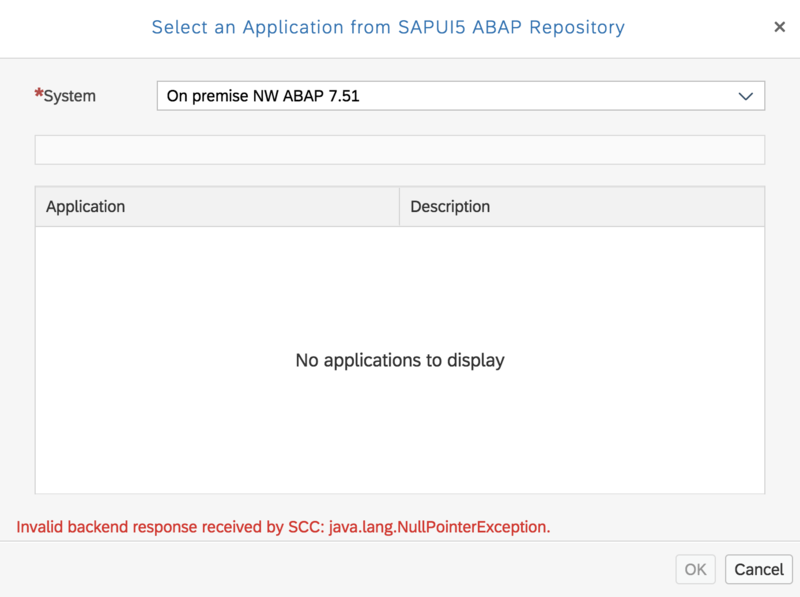 If not, Web IDE cannot “talk” to NW ABAP. Some possible errors and solutions regarding the setup are shown in this blog. 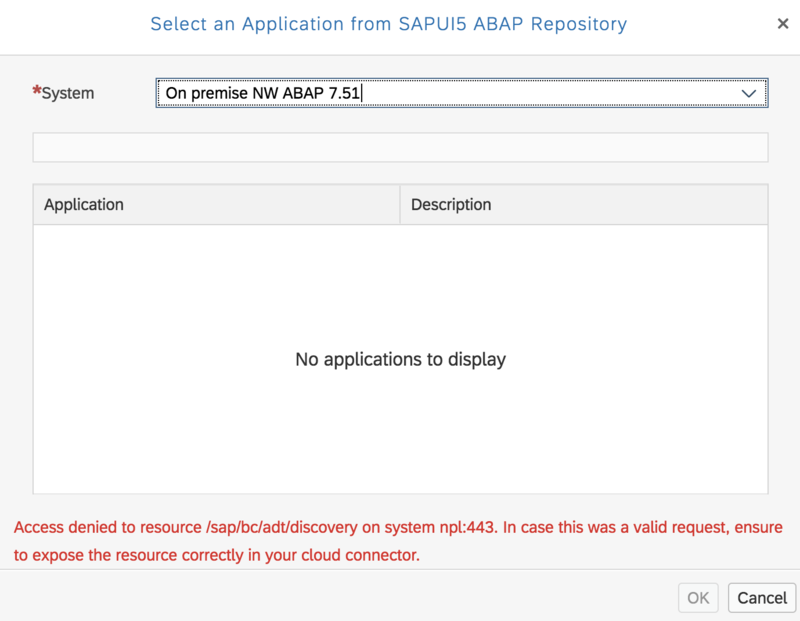 A NetWeaver ABAP system with Fiori apps is available and the SAP Cloud Connector is configured to expose the system to SAP Cloud. I am using the SAP NetWeaver ABAP 7.51 Developer Edition for the scenario. In the destination section of SCP, the SCC is shown as connected and the destination NPL is configured and working. A connection tests gives back a successful message: SCP <–> SCC <–> NW works. A developer tries to extend a Fiori app. In Web IDE, the project wizard for an extension project is used. After selecting the on premise system destination, an error message is displayed. The actual error message can differ. Sometimes you see an informative error message or just some red text or maybe nothing. In all cases, you can check the log of SCC and see a detailed information on the error. The ICF service /sap/bc/adt/discovery is not accessible. This can be because the user does not have the right permissions, or the service is not active in the NW system, or SCC is not exposing the service. Adding a service in SCC will only expose the exact path, not the sub path. 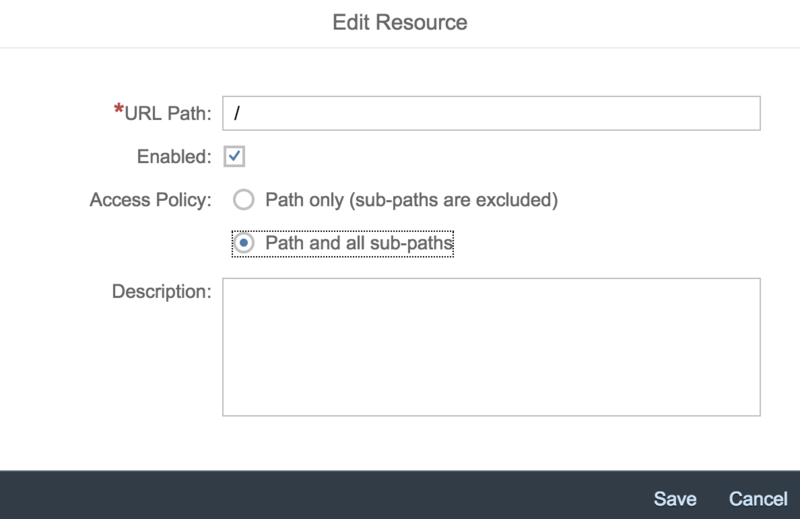 Either you add all paths exactly in the resource list, or change the access policy to accept sub-paths too. Root cause: Path only, excluding sub-paths. Solution: Change this to will allow Web IDE to access the resource. In the NW ABAP system, got to transaction SICF and check node /sap/bc/adt. This node must be activated. By default, this node is deactivated and must be activated by Basis. Solution: Activate node adt. Right click and select Activate Service. Check with SU53 and SAP Help what is missing and assign the right permissions to your user. After applying the correct solution, the developer can use the extension project wizard in SAP Web IDE to load available applications. When running a CI job you may need to use some SAP tools. For instance, the MTA builder or Neo tools. Many CI servers include integration to build tools or plugins are provided by the community or vender. Jenkins offers plugins for Maven, Ant or Node that let you easily integrate these into a CI jobs. If you have a CI job for SAP, it is your task to make the necessary tools available. There are not many plugins for SAP available for Jenkins. Some tools you may need can be found on SAP’s tool site. For instance, the MTA builder. A simple JAR file that is available for download and needed in case you are working with MTA apps. Before you can download the JAR file, you need to agree to the EUL. Running the above wget command will not download the tool, but a web site. Some may know that this is very close to how Oracle protected it’s Java download. 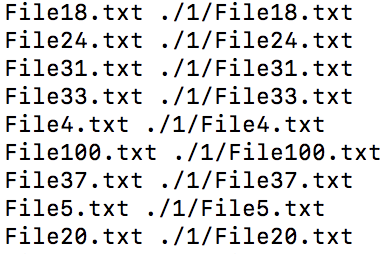 And the “solution” here is the same: send the right cookie via wget. Let’s hope SAP provides some Jenkins plugins that take care of downloading these automatically.